Over the years many people have tried to solve this problem. Some have created slits in the booklet so the cover can slide into the slit. That doesn't work well because it's difficult to slide it in perfectly and it's time consuming. Others (including myself) have used rubber bands to keep the booklets closed after being opened. None of these were very practical. I have a work-space full of rolling papers and I'd been working on this problem as far back as I can remember. Without getting into the gory details of my trial and error, I started working with magnets, ordering different sizes, materials and strengths. After more trial and error, I found one solution to the problem by using two magnets in particular ways. 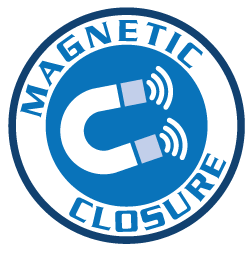 This way the distance between the magnet and the booklet was kept to a bare minimum. It was a marriage of function and physical appearance. Finally the production release of the Elements Magnet pack was accomplished. At first we didn't make a big hoopla about this new invention. We wanted to release it slowly and gain customer feedback, which was overwhelmingly positive. 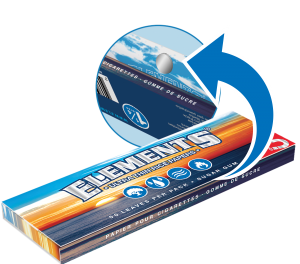 Even our competitors love it 🙂 The Elements Magnet Pack was a true game changer and solved the problem of keeping our beautiful packs closed!